274 Commonwealth is located on the south side of Commonwealth, between Fairfield and Gloucester, with 270 Commonwealth to the east and 276 Commonwealth to the west. 274 Commonwealth was designed by architect Samuel D. Kelley and built in 1885-1886 by Wentworth & Orne, builders, one of two contiguous houses (274-276 Commonwealth) designed in the same style. 274 Commonwealth was built for Warren Sherburne, a real estate dealer and former manufacturer of window glass. He is shown as the owner on the original building permit application, dated August 24, 1885. and on the final building inspection report, dated December 16, 1886 (in his Houses of Boston’s Back Bay, Bainbridge Bunting indicates that 274 Commonwealth was built for H. M. White, and 276 Commonwealth was built for W. Sherburne; however, the permit applications and deeds indicate the reverse). Warren Sherburne purchased the land for 274 Commonwealth on June 18, 1885, from Silas Whiton Merrill. 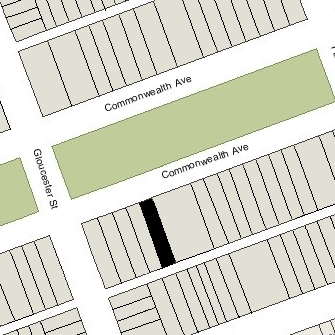 Silas Merrill also had owned the lot at 276 Commonwealth, which he sold on the same date. He was a building contractor and probably originally had planned to build houses on the two lots himself. He had purchased them on December 1, 1884, from Adelaide Joanna (Bacon) Sargent, the wife of George Darius Sargent. The lots had changed hands several times and were part of a parcel previously owned by Nathan Matthews, part of an even larger tract he had purchased on January 2, 1871, from David Sears, Jr., Frederick R. Sears, and Knyvet Sears. Click here for an index to the deeds for 274 Commonwealth. By the 1886-1887 winter season, Warren Sherburne and his wife, Mary E. (Allen) Sherburne, had made 274 Commonwealth their home. They previously had lived at 567 Columbus. They also maintained a home in Lexington. In 1893, the Sherburnes had Samuel Kelley design a new home for them at 11 Percy Road in Lexington. After it was completed, they made Lexington their primary residence. 274 Commonwealth was not listed in the 1895 Blue Book. On March 20, 1895, 274 Commonwealth was purchased from Warren Sherburne by Ella C. (Kimball) Taylor, the wife of Horace B. Taylor. He was a commission merchant and their primary residence was in Portland, Maine. 274 Commonwealth became the home of Ella Taylor’s parents, Ebenezer Kimball and Mary Jane (Mahon) Kimball. He was a housewright and carpenter-builder, and subsequently was a foreman in the Boston and Albany Railroad repair shop. Their unmarried daughter, Maude B. Kimball, lived with them. Mary Jane Kimball died in February of 1897. Eben Kimball continued to live at 274 Commonwealth with their daughter, Maude. In about 1902, Horace Taylor retired and he and Ella Taylor joined Eben Kimball and Maude Kimball at 274 Commonwealth. Horace Taylor died in July of 1905, and Eben Kimball died in March of 1915. Ella Taylor and Maude Kimball continued to live at 274 Commonwealth. 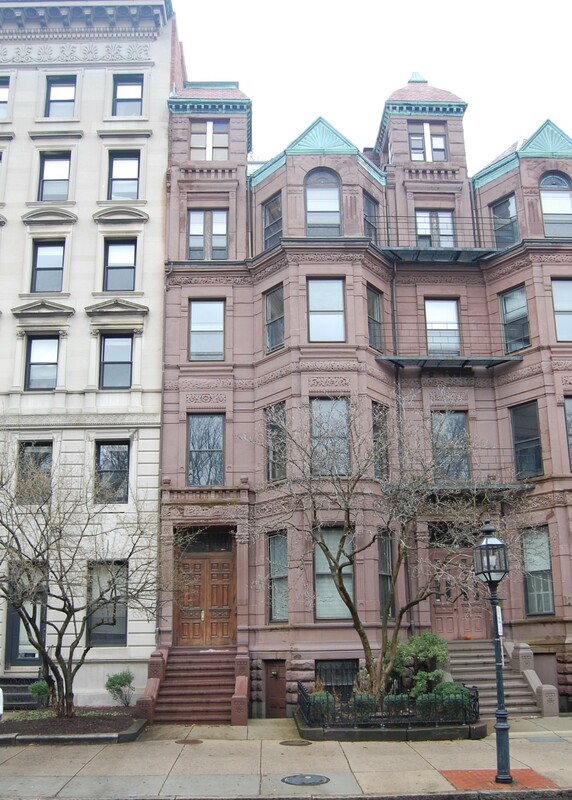 Ella Taylor died in February of 1925, and Maude Kimball moved soon thereafter to the Hotel Canterbury (southwest corner of Newbury and Charlesgate West). On August 24, 1925, 274 Commonwealth was acquired from Ella Kimball’s estate by Charles Bouin, a retired physician and his wife, May Regina (Flaherty) McEvoy Bouin, who operated it as a lodging house. They previously had lived at 702 Tremont. In December of 1925, the Bouins acquired 276 Commonwealth. In September of 1926, they lost possession of the property through foreclosure. On October 9, 1926, Arthur Baker, a banker, foreclosed on the mortgage he held on 274 Commonwealth and took possession of the property. On October 19, 1926, he transferred the property to his company, A. F. Baker & Co., which continued to operate the property as a lodging house. By 1930, 274 Commonwealth appears to have been vacant, with the only occupant being the janitor, Charles G. Munro. 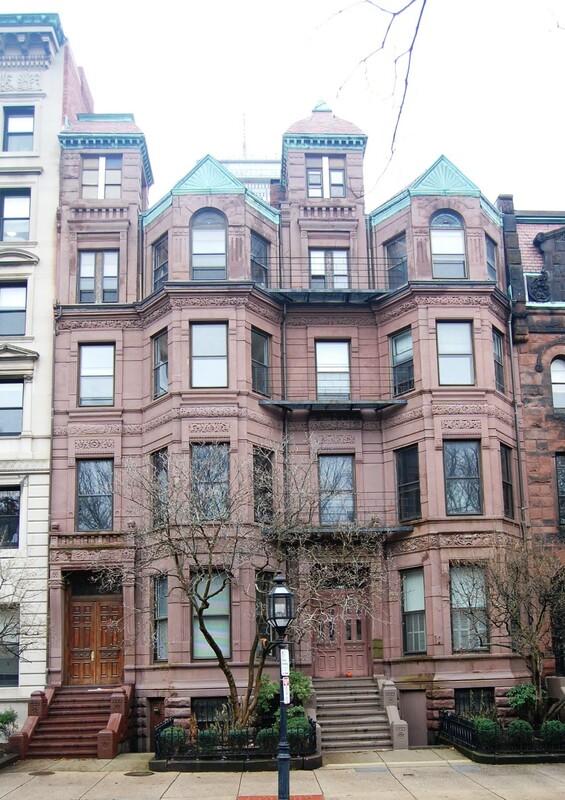 On January 29, 1931, the Massachusetts Hospital Life Insurance Company foreclosed on the mortgage it held on 274 Commonwealth and sold the property to Anastasia Walsh, and on May 20, 1931, 274 Commonwealth was acquired from her by Helen A. Delay. Anastasia Walsh and Helen Delay appear to have held 274 Commonwealth on behalf of real estate dealer Charles Francis Hurley of Cambridge. In November of 1930. he had been elected Massachusetts State Treasurer and Helen Delay was his private secretary. He served as Treasurer until his election as Governor in November of 1936. He served as Governor through 1938. Charles Hurley and his partner, James A. Carrig, had purchased 276 Commonwealth in July of 1928. In January of 1931, the same month 274 Commonwealth had been acquired by Anastasia Walsh, they applied for (and subsequently received) permission to combine 274 and 276 Commonwealth, cutting doors through the party wall, and to convert the combined property into doctors’ offices. In May of 1931, Charles Hurley acquired James Carrig’s interest in 276 Commonwealth. On March 27, 1934, he transferred 276 Commonwealth to Helen Delay so that she held both properties, presumably on his behalf. On May 1, 1941, Helen Delay transferred 274 and 276 Commonwealth to Charles Hurley and his wife, Marion L. (Conley) Hurley. They lived in Cambridge. Charles Hurley died in March of 1946. 274-276 Commonwealth continued to be owned by Marion Hurley and operated as medical offices. On September 10, 1951, 274-276 Commonwealth were acquired from Marion Hurley by Harrie P. Frost and Benjamin Green. On February 15, 1952, 274-276 Commonwealth were acquired by the Professional Building Company, which also owned 270 Commonwealth, next door. On May 31, 1962, 270-274-276 Commonwealth were purchased from the Professional Building Co. by Chamberlayne School and Chamberlayne Junior College, located at 128 Commonwealth. In August of 1960, Chamberlayne had acquired the four neighboring houses at 260–262–264–266 Commonwealth and converted them from lodging houses to dormitories. In June of 1966, it acquired 278–280–282 Commonwealth. In August of 1964, Chamberlayne applied for (and subsequently received) permission to convert 274-276 Commonwealth from doctors offices and a lodging house into dormitories. Chamberlayne College went bankrupt in the mid-1970s, and on April 2, 1976, Alfonso Vitagliano foreclosed Chamberlayne’s mortgage and took possession of 274-276 Commonwealth. On November 18, 1976, 274-276 Commonwealth were purchased from Alfonso Vitagliano by the Back Bay Restorations Company LP. In December of 1976, it purchased 278–280–282 Commonwealth from Bernard P. Rome, the trustee in bankruptcy for Chamberlayne. 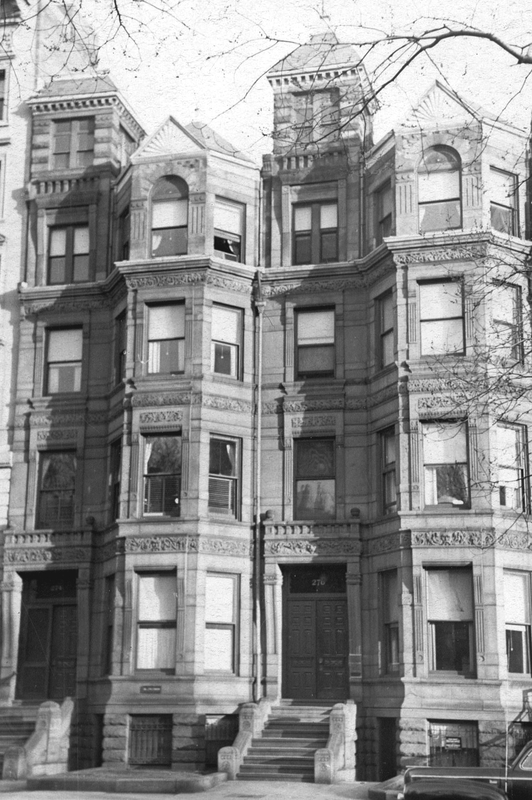 In October of 1976, prior to finalizing either purchase, Back Bay Restorations had filed for (and subsequently received) permission to combine 274-276 Commonwealth and 278 Commonwealth into one property, with the address at 274 Commonwealth, and convert the combined property into 23 apartments. At the same time, it also applied to combine 280 and 282 Commonwealth into one property, with the address of 280 Commonwealth, and convert the combined property into 18 apartments. In February of 1984, it filed for (and subsequently received) permission to increase the number of apartments at 274-276-278 Commonwealth from 23 to 25.